Leonard Schwartz, M.D. , was the creator of “HeavyHands” , an exercise method that took the US by storm, however briefly. He was the flabby, chronic smoker who whittled himself down to 4% body fat and became a model of fitness in the process! 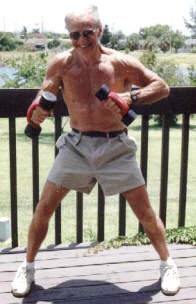 His imagination was sparked after deciding to get back “into shape” in his 50’s. He ran until a hamstring injury sidelined him and he developed an interest in building aerobic capacity in ways that couldn’t be hindered like his running. Studying the oxygen processing abilities of athletes in numerous sports, he noted that cross country skiers who used all four limbs in their activity had the best overall endurance capacity. He reasoned that adding light weights to his hands while running would dramatically increase his ability to work harder and process more oxygen with less strain on any single bodily system like the legs. Voila! “HeavyHands” was born! Throughout the years, his interest in four limb exercise continued to grow. In particular he researched ways to mimic the proven results of “HeavyHands” using methods that involved “handclasps” (“isotonometrics”) and a form of arm to arm resistance (more on that elsewhere in the site!) and also a form of aerobic calisthenics for “Strength Endurance” that also came to be called “Longstrength” or “Panaerobics”. A manuscript was in development to explain his findings to the world, but he died before it came into print. As seen in the photo, Dr. Schwartz’ physique was lean and muscular, especially his upper body. Many consider it their “ideal”, if only because the good doctor started “working out” later in life and his physique wasn’t the fabrication of drugs and other “celebrity” methods! Even years after his death, many just “starting back” find inspiration in his approaches and results! This site is devoted to using existing clues from Dr. Schwartz’ contacts and students, recorded patents, videos, books, etc. to “piece together” and understanding of how to participate in a program of “Strength Endurance, Panaerobics, or Long Strength” by piecing together the hints on these topics still available for those interested in Dr. Schwartz’ legacy. Over time we’ve begun to discuss related topics, but always go back to Dr. Schwartz in some way. Why this site? It feeds the author’s new exercise habits and serves as a hobby! This site makes no claim to perfectly understand Dr. Schwartz’ intent or to apply existing clues “properly”. As researchers will themselves find, Dr. Schwartz had a variety of “students” who now are his “interpreters”. Often they can only agree in their admiration for Dr. Schwartz! Some are critical of the way other students present Dr. Schwartz’ findings! While we and others are all doing our best to understand the discoveries Dr. Schwartz’ work inspired, no single author can – it appears – lay claim to “authoritatively interpreting” Dr. Schwartz on the issues of “Strength Endurance, LongStrength, and Panaerobics”. Until his final manuscript becomes available, if ever, his admirers and aspiring students will simply have to do their best to decipher the clues that are available to the public and craft their own exercise plan in light of those findings. Thanks for reading! The author assumes you’ve both read and agreed to the terms below in order to use the site! Please use the contact form or comments for your feedback. Readers agree that this site is for information purposes only and that they will only exercise or attempt to mimic Dr. Schwartz’ protocols after getting the “all clear” from their own personal physician. Furthermore they acknowledge that this site is consulted for information purposes only and they recognize it is not designed to offer professional advice in any area (health, exercise, nutrition, or anything!). For that readers agree to consult their own properly licensed professionals. Affiliate links are often used throughout this website and this constitutes notice of that fact for users of this site. Thank you for your patronage. We especially participate in the Amazon.com affiliate program and we appreciate your use of these amazon links. Guest posts on related topics may be provided from time to time by other writers who may or may not take an approach wholly or partially similar to Dr. Schwartz’ methods. Their presence here does not imply complete agreement. They are only offered as possibly of interest to exercise and fitness enthusiasts! All Trademarks are freely acknowledged. All articles are copyright by the author of this site and written permission must be obtained in advance if the material is used elsewhere on the web. Violations will be reported. All original material is otherwise copyright by Chuck Huckaby and may not be reprinted without prior written permission. Final Word: Have your own insight from your conversations/correspondance with Dr. Leonard Schwartz on HeavyHands, Panaerobics, IsoTonoMetrics, etc? We’d love to hear from you and document your experience here for others to find! Please leave a comment on any page and the blog curator will get in touch with you! Thanks!